Get ready for a treat as Walt Disney World celebrates Fourth of July with a unique choice of fireworks shows at several different theme parks. To celebrate Independence Day, the Magic Kingdom will have special pyrotechnics and Epcot will add a patriotic “tag” to its famous “IllumiNations: Reflections of Earth” spectacular. Parks fill to capacity early on July 4th. The Mouse For Less recommends arriving at your preferred park early and staying throughout the day. While the Walt Disney World Resort guarantees onsite guests will have park entry, it does not guarantee entry into a specific park, even if you have dining reservations. To make a long day more comfortable, pack any items you may need throughout the day and stow them in one of the theme park lockers at the front of the parks. Information below is for 2018, however, most of this information will remain valid for 2019. Page will be updated fully for 2019 when details are released. America’s birthday is celebrated on two days, as Guests will be able to enjoy Fourth of July festivities on both July 3 and July 4. Celebrate Independence Day with the spectacular “Disney’s Celebrate America! A Fourth of July Concert in the Sky.” The 14-minute fireworks spectacular rockets into the sky above Cinderella Castle at 9:00 p.m. on both nights. The firework show is set to an exciting musical score specifically created to stir a sense of pride in being American, while at the same time, inviting guests from around the world to feel part of the celebration. 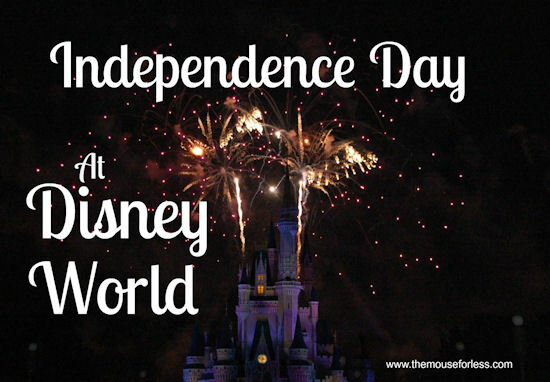 Looking for other ways to celebrate Independence Day at the Magic Kingdom? Honor the country’s highest office by stopping at the infamous Liberty Square sow, Hall of Presidents. The Hall of Presidents includes all 45 U.S. Presidents and traces the history of the prestigious office. You also won’t want to miss the Flag Retreat which takes place at 5:00 p.m. each day on Main Street U.S.A. where Guests can pledge allegiance and hear patriotic songs as the flag is lowered. A veteran is selected for the honor and Guests looking to be a part of the show should check with City Hall to see if availability is open. Guests should also catch The Muppets Present…Great Moments in History. During this show, Miss Piggy, Kermit, Fozzie Bear and friends reenact famous moments in American history in a whimsical way. The live show is performed daily in Liberty Square. Park Hours July 3, 2018 – 8:00 p.m. – 12:00 a.m. Extra Magic Hours: 12:00 a.m. – 2:00 a.m.
‘Concert in the Sky’ Fireworks – 9:15 p.m.
Park hours on July 4 – 8:00 a.m. – 12:00 a.m. The Magic Kingdom is the most popular of Disney’s 3 theme parks from which to see fireworks. The park almost always closes due to capacity during some portion of the day. If you can’t bear the thought of huge crowds, we have an alternate plan to experience the Magic Kingdom’s holiday fireworks. See the Magic Kingdom’s special Independence Day fireworks on July 3rd when they are also shown. Plus, you’ll be able to see a second nighttime spectacular at Epcot, Disney Hollywood Studios, or Disney’s Animal Kingdom on the 4th. The 4th of July fireworks in the Magic Kingdom are spectacular and are shot over Cinderella Castle, as well as all around the park perimeter. The best view is anywhere along Main Street U.S.A., as long as you don’t go beyond the Partners statue (Walt & Mickey) in the hub. Or, grab a spot on the train station platform, and you might be lucky enough to get a seat for the show; you’ll have to stakeout your spot hours in advance, though. And, to view the fireworks over all 3 castles, view the fireworks from new Fantasyland. Those wishing to view Magic Kingdom’s special fireworks from outside the parks can do so from the observation deck on the 4th floor of the Contemporary Resort, from Transportation and Ticket Center along the walkway to Ferry loading area (breathtaking free views with piped in music), as well as restaurants such as California Grill, ‘Ohana or Narcoossee’s, or for a large group, a Magic Kingdom fireworks cruise. You can also catch the show at one of the beaches at Disney’s Polynesian and the Grand Floridian Resort though sometimes these areas are closed to only resort Guests. If you are planning to watch the Magic Kingdom’s 4th of July fireworks from one of the resorts, you will need to use Disney transportation to arrive, as the parking lots at these resorts are usually closed to all but resort guests and those with dining reservations on the 4th. Other non-traditional patriotic offerings that guests can enjoy in the Magic Kingdom include a taste of traditional New England-inspired foods at Liberty Tree Tavern, a restaurant situated in a colonial-style inn that serves lunch and dinner daily. The Stars and Stripes and the Liberty Bell are the most cherished symbols of freedom in The United States of America. The Liberty Bell replica that anchors Liberty Square was cast for Walt Disney World in Annecy-le Vieux, France by the Paccard Fonderie, using the exact same mold as the original Liberty Bell. The Liberty Square bell stands eight feet tall, weighs two and a half tons, and is comprised of copper, tin, lead, zinc, arsenic, gold and silver. It was hoisted into its present location by a crane, just in time for the 1989 Independence Day Celebration. Let Freedom Ring! There will be Dance Parties in both Frontierland and Tomorrowland on July 3 and July 4. 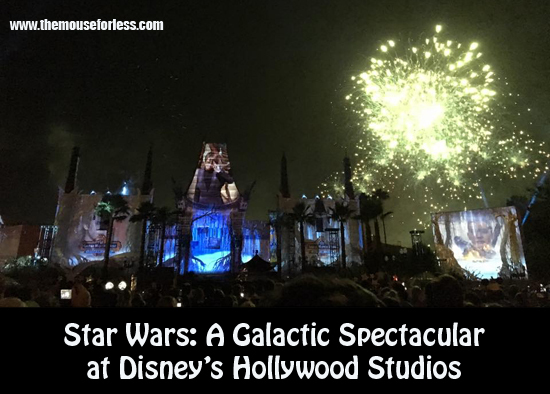 While not the most patriotic, Disney’s Hollywood Studios will be celebrating the 4th of July with the “Star Wars: A Galactic Spectacular” fireworks spectacular. The show will take place at a special time on July 4 at 10:00 p.m. The Star Wars-themed fireworks show dazzles with themed fireworks, lasers, special effects and video projections of iconic characters and scenes from the saga, all set to the unforgettable film score. Park Hours July 4th – 8:00 a.m. – 10:30 p.m.
Star Wars: A Galactic Spectacular – 10:00 p.m.
Fantasmic – Disney’s nighttime entertainment extravaganza takes place at 9:00 p.m. & 10:30 p.m.
A new pre-show has been introduced at Disney’s Hollywood Studios called Disney Movie Magic. This new pre-show takes place a half hour prior to the fireworks and lasts about 10 minutes. Based on past attendance, this should be one of the least crowded of the parks. For the best view of Disney’s Hollywood Studios fireworks, find a spot on Hollywood Boulevard facing The Chinese Theater. Independence Day crowds in the park can be challenging for groups. Bringing as many cellphones as possible is great way to reunited with any members of your party that may have become separated and good tip for all of the parks, especially during overcrowded events. In addition, an afternoon of live entertainment kicks off at America Gardens Theatre with the Voices of Liberty, an eight-part, a capella Voices of Liberty. who will be performing on Independence Day at the American Gardens Theatre at 5:30 p.m., 6:45 p.m. and 8:00 p.m. Disney Characters dressed in Independence Day attire will meet guests during the day at The American Adventure. The evening will end with a bang, literally, as Guests enjoy IllumiNations: Reflections of Earth which features dazzling special effects, colorful lasers, brilliant fireworks and fiery torches all choreographed to a musical score, becomes even more dynamic on July 4th. The normal show will be enhanced with “The Heartbeat of Freedom,” an overture of traditional Americana themes displayed in a pyrotechnic and laser light event. The performance begins at 9:00 p.m. on July 4. Daily at Epcot, the American Adventure spotlights American history and heritage. The show is a journey through important moments in America’s history narrated by Audio-Animatronic figures of Benjamin Franklin and Mark Twain. Guests should also check out the “The Kinsey Collection,” in the American Heritage Gallery at the American Adventure Pavilion, which is an exhibit that showcases 400 years of African-American achievement through rare art, documents, books and artifacts. Park Hours July 4 – 9:00 a.m. – 9:00 p.m.
Illuminations: Reflections of Earth – Disney’s nighttime fireworks extravaganza takes place at 9:00 p.m. There are a couple of restaurants with a great view of Illuminations. 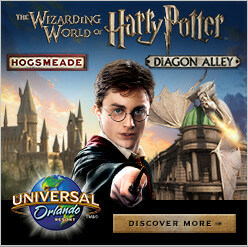 None will guarantee a window or patio seat, but if you book your reservation at Hacienda de San Angel in Mexico, Spice Road Table in the Morocco Pavilion or Rose and Crown Tavern in the United Kingdom about 2 hours prior to the show, you might be lucky enough to score a prime viewing spot. The best spots to watch Illuminations in the park, if you’re not making restaurant reservations, are between the two gift shops in the entrance plaza of World Showcase. This area is often referred to as “Center Stage” and is a FastPass+ reserved viewing location. Other great viewing spots are on the the bridge between France and the United Kingdom, the Italy Isola (the waterside dock across from the Italy Pavilion) and the area behind Rose & Crown Pub. The latter two are often reserved for private parties and may be unavailable. If there are no open spots around the lake from which to view Illuminations, you might try the elevated platforms at the front of Tokyo Dining in Japan or near the gift shop in Canada to get a better view. For those who prefer to bypass the crowds in the parks, the Epcot resort area offers a unique view of fireworks from all 3 parks – Magic Kingdom, Epcot and Disney’s Hollywood Studios. 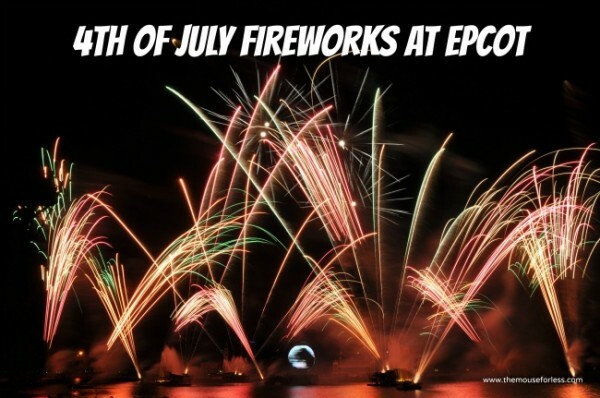 If you are planning to watch the Epcot’s 4th of July display from any of the Epcot Deluxe resorts (Boardwalk Inn, Beach Club, Yacht Club), you will need to use Disney transportation to arrive, as the parking lots at these resorts are usually closed to all but resort guests and those with dining reservations on the 4th. For a uniquely different way for a group to see Epcot’s firework finale, consider booking a private fireworks cruise. Securing one of these cruises is not for the faint of heart, however. Disney doesn’t announce when it will begin taking reservations for special event fireworks cruises and availability is extremely limited. We suggest calling Disney’s Recreation line (407-WDW-PLAY) as soon as phone lines open (7 a.m EST) each morning, every day beginning six months out for an illuminations boat. Yes, you heard right, every single day! 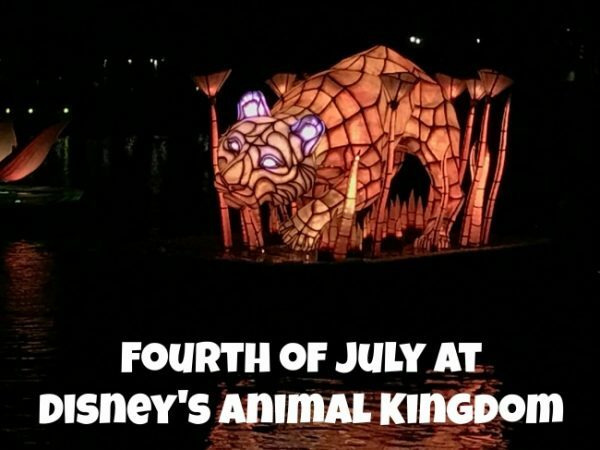 A special fireworks extravaganza is not held at Disney’s Animal Kingdom park on Independence Day. Disney’s Animal Kingdom just rolled out a new nighttime spectacular, Rivers of Light that celebrates a connection with nature through light, water and fire. There is also a slew of other nighttime festivities, including dance parties, Kilimanjaro Safaris after Dark, and more that Guests can experience. The park will be open from 8:00 a.m. until 11:00 p.m.
Park Hours July 4th – 9:00 a.m. – 10:30 p.m.
Rivers of Light – 9:15 p.m. & 10:15 p.m. Extra Magic Hours: 8:00 a.m. – 9:00 a.m. The Fourth of July 5K Run will take place Tuesday, July 3. Pre-registration is available June 24-30 from 9:00 a.m.-5:00 p.m. at the Fort Wilderness Bike Barn. On-site registration begins at 7:00 a.m. in the field; the run begins from that location at 7:30 a.m. The Fourth of July Golf Cart Parade begins at 4:00 p.m. on July 4. 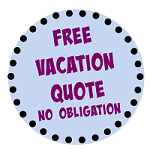 Registration will be open June 24-30 from 9:00 a.m.-5:00 p.m. at the Fort Wilderness Bike Barn. The Fourth of July Beach Bash at Clementine’s Beach will take place from 6:00-11:00 p.m. on July 4. Guests will enjoy a live DJ, dancing, games, contests, a movie, and more. In addition, the Fort Wilderness food truck will be available in the settlement area with delicious items for purchase. Select theme parks and resorts will offer exclusive dessert items in honor of Independence Day. A Fourth of July cupcake featuring an apple-pie filling at Creature Comforts and Isle of Java at Disney’s Animal Kingdom. Patriotic dipped strawberries and Mickey Mouse and Minnie Mouse mini-domes at Amorette’s Patisserie at Disney Springs. The Seven Seas Lagoon glitter with patriotic pride when the Electrical Water Pageant sets sail. The pageant features the American flag and red, white and blue stars set to patriotic tunes, along with favorite sea creatures. Guests can view the water pageant nightly from various resorts surrounding the lagoon. Times and events listed are subject to change. For the the most recent schedule, consult Walt Disney World’s calendar.